1. In the same pan, saute garlic, onion and ginger. 2. Add pork then stir cook for 5 minutes or until light brown and start to sizzle. 3. Add oyster sauce, soy sauce, water, salt and ground pepper then simmer for 10 minutes or until tender. 4. Add broccoli and cauliflower then cook for a minute. 5. Pour dissolved cornstarch then simmer until thickens. Adjust seasoning according to taste. 6. Remove from heat then transfer to serving bowl. Serve immediately with steamed rice. 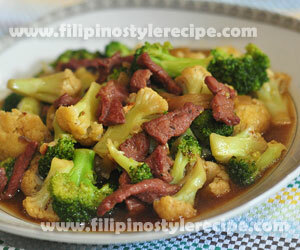 Filipino Style Recipe: beef broccoli and cauliflower is another easy and healthy beef dish. The beef cut into strips then marinated and stir cooked with broccoli and cauliflower in a blend of oyster sauce, cornstarch, salt and pepper. Estimated time of preparation and cooking: 45-50 minutes. sugar, salt and pepper to taste. 1. In a bowl, combine beef, soy sauce, lemon juice, salt, ground pepper, sesame oil and marinate for 15 minutes. 2. Add beef then stir cook for 5 minutes or until light brown and start to sizzle. 3. Add oyster sauce, water, sugar, salt and ground pepper then simmer for 3 minutes. 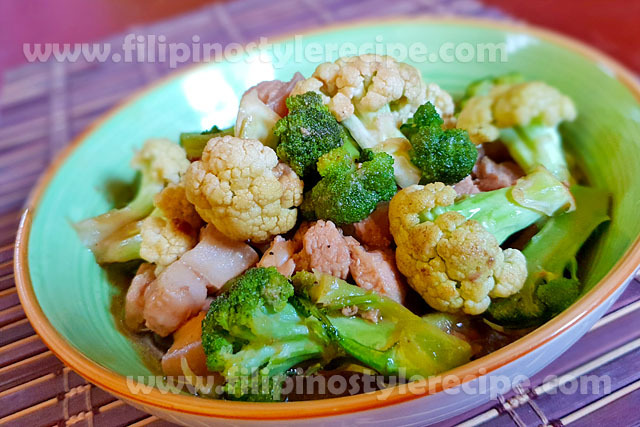 Filipino Style Recipe: stir fry cauliflower in oyster sauce is another healthy low carbohydrate dish. 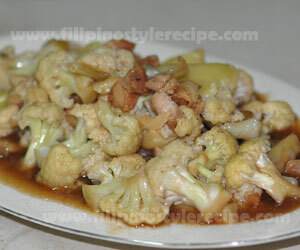 Normally the cauliflower cooked with pork in a blend of oyster sauce, dissolved cornstarch and other seasonings. 2. Add pork and stir fry until golden brown. 3. Add cauliflower, oyster sauce and pour dissolved cornstarch then simmer for 2 minutes or until the sauce is thicken. 4. Season with salt and pepper according to taste. 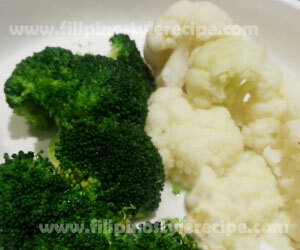 Filipino style recipe: broccoli and cauliflower salad is a quick and easy side dish. It is mainly made up of steamed broccoli and cauliflower then add lemon juice, olive oil, garlic, onion, salt and pepper. 1. In a bowl, mix lemon juice, olive oil, garlic, onion, salt and pepper. Mix well. 1. In a steamer, steam the broccoli and cauliflower for about 8 minutes. 2. Transfer the broccoli and cauliflower into a bowl and add the dressing.